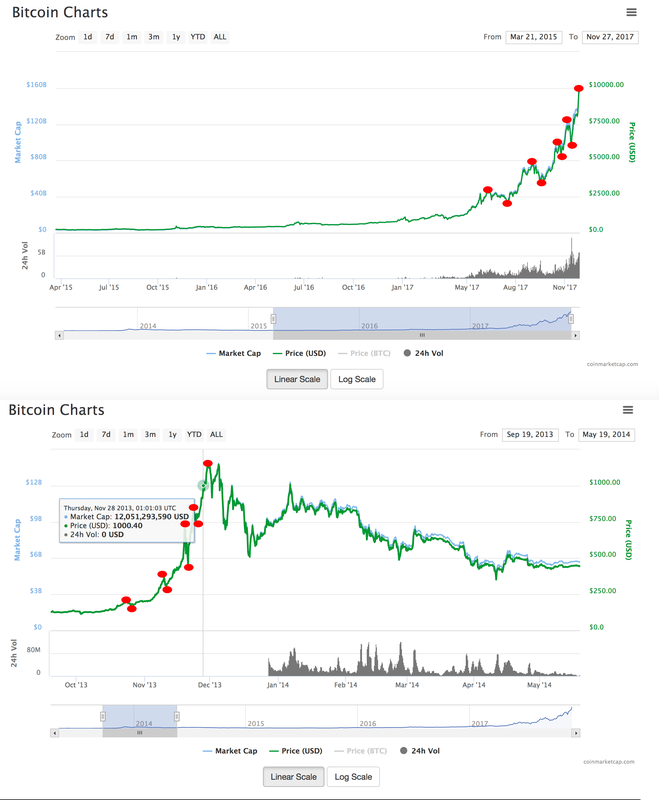 With the recent seemingly unstoppable rally of bitcoin and other cryptocurrencies, which is fuelling mainstream adoption like merchant account and payment processing startups to provide the infrastructure for excepting payments in the digital currency, and the CME announcing regulation for the futures market we decided to take a look at the 2013 rally (and subsequent crash) to see what similarities there were. Quite a lot is transpires. First up here are both the charts side by side. The first chart is the current rally, followed by the rally and crash of 2013. Both the 2013 and 2017 rallies contain obvious 9 wave patterns, similar to that of the well used Elliot Wave. Although the Elliot Wave is traditionally a 5 wave sequence is can be used with 7 and 9 wave patterns. This is when things get a little bit freaky, both waves have approached a very significant number on the exact same day November the 27th. The 2013 rally was then approaching the first major milestone of $1000, at $913, and this time we are fast approaching $10,000, with current prices at $9,400. Investors and traders tend to favor round price points, electing to take profits once the stock, currency or asset reaches a certain psychological point. If the $10,000 mark is breached tomorrow as predicted, it will be highly interesting to see if the same patterns follow. The reason for this almost identical timing is unknown currently. Could it be a seasonal and technical predictor of future movements in the days and weeks ahead, or just pure chance? Only time will tell. The 2013 rally did break though the $1000 barrier briefly to $1121 on November 30th, only to crash significantly over the months after to as low as $226. The period following was a long sustained bear market with large sell-offs. It took until January 2016 to regain the previous highs. A new high in the $11,000 – $11,500 range, followed by a sharp correction will certainly make an interesting parallel to 2013. 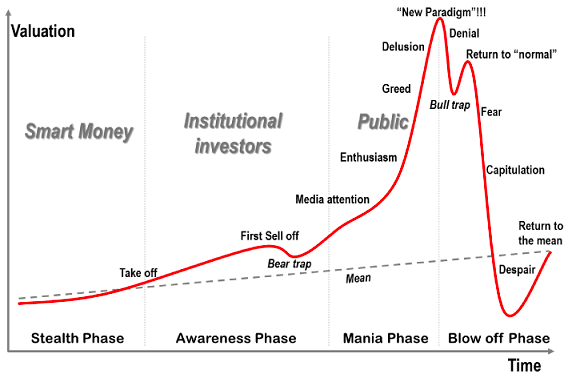 This chart shows how traditional bubbles behave created by Dr. Jean-Paul Rodrigue. The similarities with both Bitcoin price rallies is notable. Written by Ollie Smith, CEO of ExpertSure and avid crypto fan.